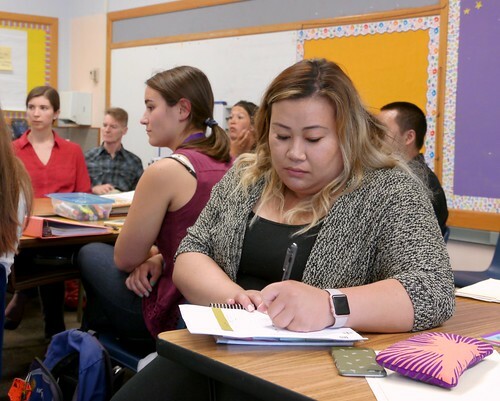 During the past year, the University of Washington College of Education has undertaken an initiative to change that norm and better serve teacher candidates, mentor teachers and partner schools. A Mentorship Design Lab held at Seattle’s Roxhill Elementary in July was the most recent in an ongoing series of activities developed to support local educators in improving their practice as both mentors and teachers. Kara Jackson, assistant professor in the University of Washington College of Education and director of the Ackerley Partner School Network, noted that a teacher candidate spends more time with their mentor teacher than anyone else as they prepare to enter the profession. Over the course of two days at Roxhill, mentor teachers were introduced to tools for supporting candidate learning while observing UW elementary teacher candidates practice read alouds with children. One of the tools the mentor teachers practiced with was charting. A tool borrowed from special education, the mentors learned how to use charting to observe and quantify a teacher candidate’s activities during a lesson—from the number of times a candidate gave students evaluative versus non-evaluative feedback during the lesson to how frequently a candidate called on different students—and then offer immediate feedback. “What we’re trying to do is figure out if we can develop some tools that will help mentor teachers step side-by-side with candidates during teaching and throughout the course of the year to scaffold their learning more fully,” said Adrian Cunard, a teaching associate at the College who facilitated the lab. Embedding the work with mentor teachers inside actual content, such as read alouds, offers benefits beyond being able to offer candidates more targeted, constructive feedback. Kevin Gallagher, a kindergarten teacher at Seattle’s Bryant Elementary, has mentored approximately 20 teacher candidates during his career and said those experiences have helped him delve deeper into his own teaching. “Every day that I spend time with a candidate I feel my own practice continues to blossom because I’m being more analytical about my own work,” Gallagher said. Gallagher said he was excited about the potential for using charting to examine a small slice of teaching practice both quantitatively and qualitatively with a mentee and observe a teacher candidate’s growth over time. Sarah Schneider Kavanagh, a post-doctoral researcher helping lead the College’s support of mentors, said UW teacher educators have learned much about mentorship by bringing mentor teachers together to share their practice with one another. “It's been so inspiring that in October we're expanding our circle of collaboration to bring teacher education scholars and mentor teachers from around the country together for a conference so we can share this work more broadly and learn from others,” Kavanagh said. Jackson noted that area schools provide an essential service to the College by taking teacher candidates, and she said offering the mentor design labs through UW’s Ackerley Partner School Network is a way to give back. “By supporting teachers within a school building in thinking deeply about how they can support others’ learning, we have an opportunity to contribute to the overall capacity of a school to support teacher learning and instructional improvement more generally,” Jackson said.